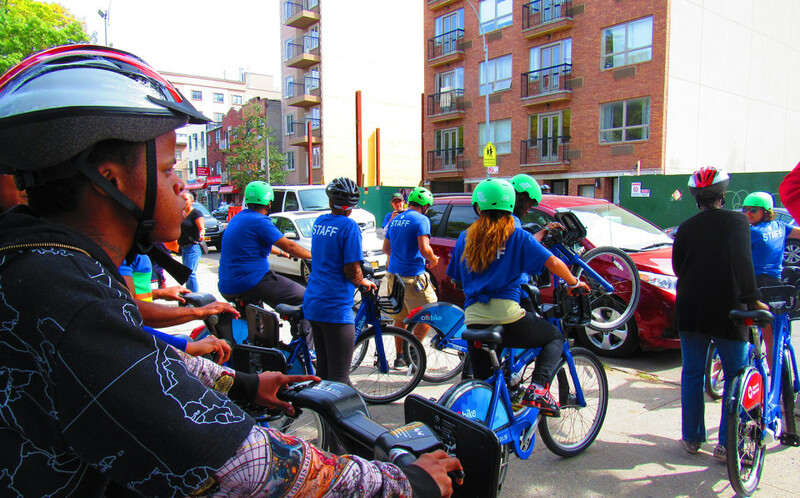 A Citi Bike group ride in Bed Stuy. As the nation’s oldest community development corporation, Bedford Stuyvesant Restoration Corporation has learned that partnerships must be two-way streets. They will collaborate, not cheerlead. 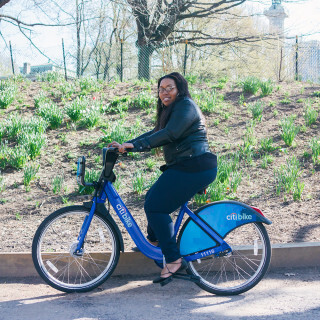 When the New York City departments of transportation and health approached them about applying alongside them and Citi Bike for a $75,000 Better Bike Share Partnership equity grant, the leaders at Restoration had reservations. Like many of the members of the community they have served for more than 50 years, they saw bike share as something coming into their neighborhood whether they wanted it or not. They worried decisions would be made without their input. Before signing on, they wanted to know their feedback would be heard and taken seriously. 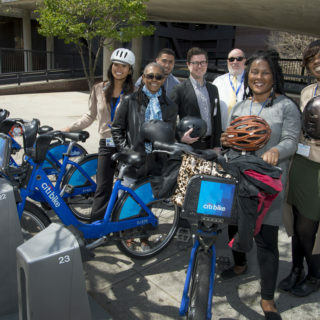 Restoration provides services across all of Brooklyn; however, their bike share initiative focuses on the Bedford Stuyvesant neighborhood, where Citi Bike recently added 26 new stations. Bed Stuy is a roughly three-square-mile neighborhood bordered on all sides by subway lines. That can make for unique transportation issues, because, as Jacob puts it, “The subway lines were built to get through the neighborhood, not to service them.” Many residents still drive by car because public transit stops are too far away. 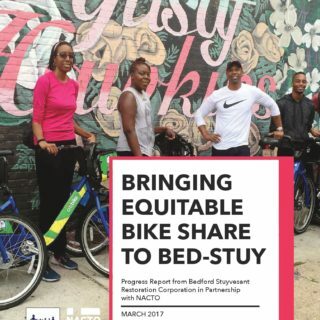 But bike share may be a more flexible solution for many of the 150,000 residents of Bed Stuy. 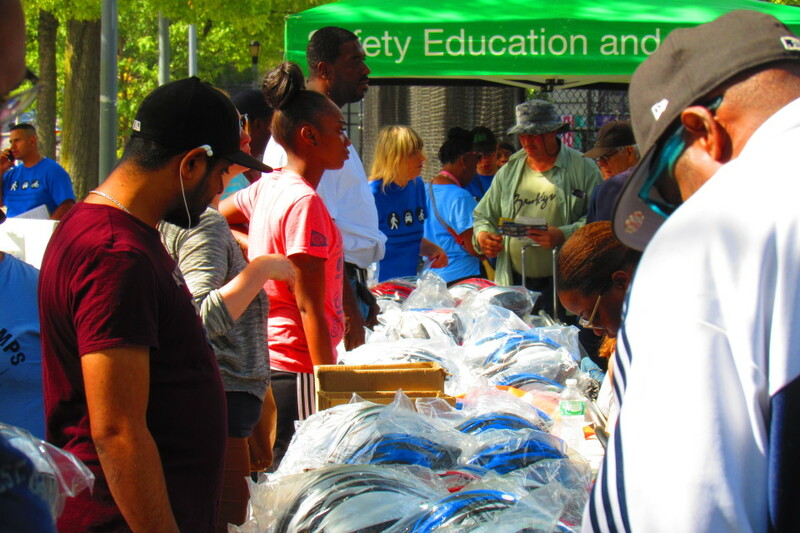 NYC DOT provided hundreds of helmets to give out to residents of Bed Stuy. As part of their collaboration to promote this idea, Restoration, Citi Bike and the city orchestrated a large family-friendly community event in Marcy Playground to celebrate the bike share’s expansion into their Brooklyn neighborhood. Upwards of 700 bike helmets were passed out. Bike share access was provided. Fitness and bike safety classes were held, as were medical and health screenings. All of it was free for residents. If any doubts lingered in the minds of Jacob and the other partners, the celebration event put them to rest. Restoration’s respected standing within the community could bring out the crowd. DOT had the supply of hundreds of helmets and the manpower to hand them out. Citi Bike offered what it could in the form of free rides. With that foundation, it was easier to get buy-in from other participants like Bike New York and private medical partners. The well-trafficked event was bursting with energy and excitement, receiving positive press and enthusiasm from the local councilmember. And it wouldn’t have been possible without leveraging the resources of many organizations. For a bike share operator looking to advance equity, large events like this may be the most noticeable form of collaboration. However, equally important in the Citi Bike-Restoration partnership is the constant feeding of ideas for making bike share a community resource, and the flow of information about concerns people have. 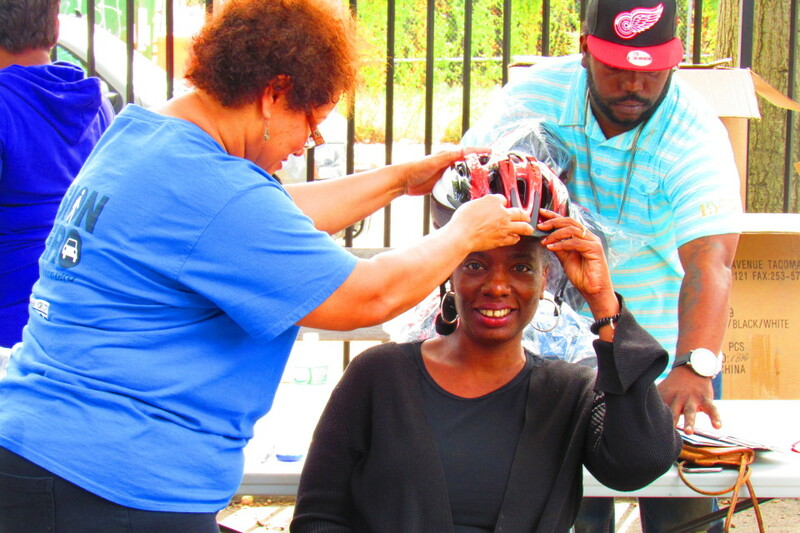 Tracey Capers of Restoration sits for a helmet fitting. It’s this aspect of the partnering process that often proves most difficult. Restoration found this out the hard way when it discovered one day a new Citi Bike docking station had unexpectedly popped up around the corner from its own building, a decision the bike share had made after the original site wound up being unavailable due to construction. Despite having a good partnership with Citi Bike overall, the station change had failed to make it to their ears before it made it to their streets. The result was unhappy residents who felt the station was an accident waiting to happen. That includes not just working together on the flashy, fun promotional stuff, but also on the minute details like station siting changes that affect their neighborhood. Speed bumps like this aside, Restoration hopes to continue partnering with the city agencies and Citi Bike to continue promoting bike share as a beneficial form of public transit for their community.